Not everyone views the idea of “All you can eat” as an invitation to well… eat all you can. According the Brian Wansink, Ph.D., director of the food and brand lab at Cornell University in Ithaca, N.Y., some people actually manage to restrain themselves when faced with a myriad of food choices and unrestricted portion sizes. In several studies, Wansink deployed a team of research assistants to surreptitiously observe the strategies people use to navigate all-you-can-eat buffets like the kind you find at holiday parties and large family gatherings. Based on his findings, Wansink says it’s possible to survive an all-you-can-eat experience without having to unbutton your pants or loosen your belt several notches. 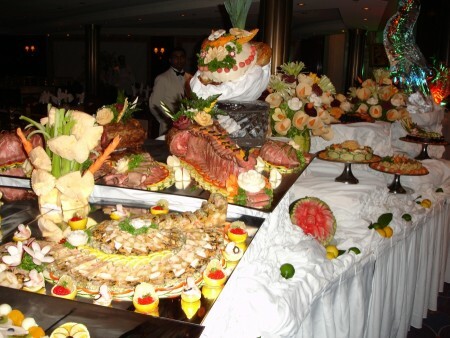 Here, he offers seven strategies for staying within your calorie budget at the Holiday buffet. Survey Before Serving. Wansink’s research discovered that heavier people have a tendency to start at the beginning of the buffet and move from dish to dish until they reach the end of the salad bar. Slim people, on the other hand, take a lap around the table, scout out their favorites and decide what they can pass up without feeling deprived. So before you so much as crunch on a crouton, map out a plan of attack. Think Small. Wansink’s findings show that skinnier buffet goers are eight times more likely to select a smaller plate than their heavier counterparts. The reason? When you’re hungrier, you go for the largest plate you can get your hands on. If you’re trying to limit the damage, take a smaller plate and fill it to the rim. Not only will you take less per serving, you’ll probably take fewer helpings. Wansink has found that those who chose a plate with more real estate make 30 percent more return excursions to the buffet bar. Drink Slender. Make visual illusions work for you. This works especially well with beverages. If you don’t fill your glass, you’ll tend to pour 30 percent more into a wide glass than into a slender one. Cultivate Buffet Blindness. One of the biggest predictors of how many trips you make for additional helpings is where you sit. In Wansink’s studies, diners with a clear view of the munchies averaged 2.7 trips to the buffet to refill their plates versus just 2.3 trips for diners who turned their back on them. The combination of seeing everyone else piling food onto their plates and the visual focus on food does your willpower no favors. Choose Chops. In Wansink’s studies, slimmer diners were seven times more likely to opt for chopsticks rather than a fork when they were available. Why? He speculates that using chopsticks slows things down and turns eating into more of a dining experience. Start Light. One of the best tricks for eating less when the theme is all you can eat? Keep your initial foray vegetarian. However, resist drowning your veggies in heavy sauces and creamy dressings. Obviously that defeats the purpose. For that matter, so do high calorie beverages and super rich desserts. Do A Few. You don’t have to embrace all these strategies at once, Wansink points out. Just adopt one or two at a time. Little changes can make a big difference in how much you eat. Now check out the rest of AcaciaTV’s Week 7 of the Maintain, Don’t Gain Holiday Challenge to help keep your weight under control through the holidays. Start now (even if you missed the first part of the challenge) and you can still ring in the New Year without having to worry about seasonal weight gain.